EVERLIGHT is a famous power LED manufacturer. Alongside with this, it produces infrared LEDs, optic switches, proximity sensors, LED displays, SMD LED, transistors, triacs, triggers, IGBT, SSR relays and integrated circuits. The company is founded in 1983 and receives ISO 9001 in 1996. 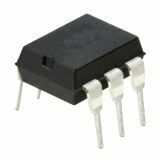 Optocoupler EL817, 1 channel, 35V, THT, DIP4, transistor One-channel EL817 opto-coupler, 35 V eco collector voltage, 50 mA output current and DIP4 housing. List Price 0.40лв. VAT Incl. 0.38лв. VAT Incl. 0.36лв. VAT Incl. 0.34лв. VAT Incl.